Over the weekend, New York drag icon Honey Davenport took a stand, when she had an experience with something few would readily acknowledge in queer performance art and nightlife circles: racism — something she tells PAPER is "a cancer in our community." As NewNowNext reports: "[NYC] West Village gay bar The Monster is known for its drag shows and go-go boys, but a flier promoting one such event did not meet the preferences of bar manager Italo Lopez, who texted about his dissatisfaction to DJ/Producer Mitch Ferrino." The event in question was Davenport's show "Manster." Lopez said the flier made it seem as though The Monster was promoting a "black night," which was "not good for the business." He also said the men pictured should be "beautiful," (implying somehow that they weren't), to which Ferrino replied that they were. In what was slated to be the scheduled performance, Davenport addressed the crowd directly, saying that it would be her last time performing there before walking offstage and leaving the venue entirely. The ensuing uproar led to multiple drag queens standing in support with Davenport and calling for a boycott of the well-known hotspot, as well as patrons coming forward with their own stories of racism and discrimination within gay bars. Upon Ferrino's and Lopez's subsequent resignations (Ferrino also sided with Davenport in the fall-out) The Monster's owner Charles Rice issued a statement on Facebook, writing that he would, from here forward, require all Monster employees to attend racial sensitivity trainings. "[O]n behalf of The Monster, I am sorry," the statement reads. "I can't take away any of the negative feelings you may have about us as a result of this situation, but I can promise that it does not represent us in the past, present or future. We will use this experience to grow and ensure our words, our behavior and our advertising represent us all." 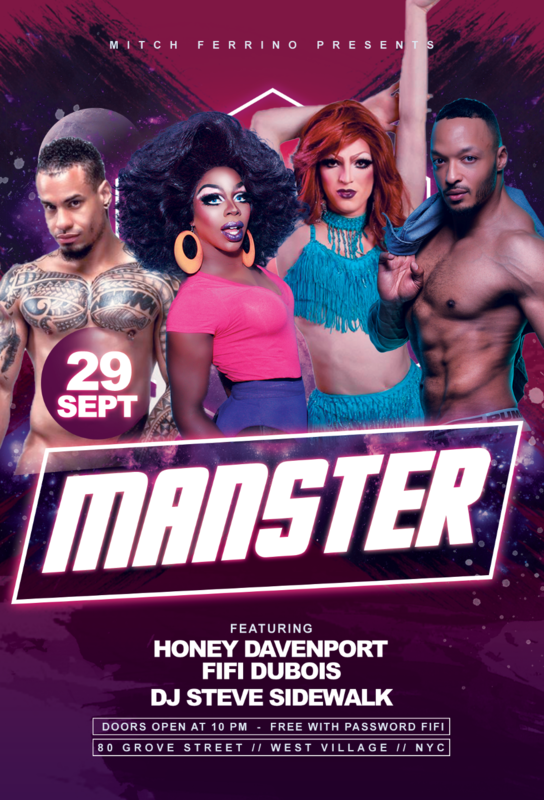 But Davenport, who has performed at The Monster, which she says had been her "home bar" for the past 6 years, is determined to address the issue at-hand by holding those involved in the incident accountable. At 2 PM on Thursday, October 4 Davenport will hold a press conference, open to the public at the West Village's Stonewall Inn, and is inviting all parties involved to have an open, constructive dialogue around the nuances of the incident, in hopes for greater accountability around racial awareness in the LGBTQ and nightlife communities. PAPER caught up with Davenport to hear her side of the story, and why she felt it important to plan this event. I want to get a sense of what happened, in your words, and to tell a larger story of how racism and microagression affects Black performers within queer nightlife circles, where we often believe safety or protection is assured, but sometimes we're proven wrong. What led you to decide you'd no longer perform at The Monster? On Friday afternoon, my manager Mitch Ferrino, who manages my drag career now, forwarded me messages from The Monster about my flyer that he had seen from bar manager Italo [Lopez] that he felt were extremely inappropriate. He had talked to me before about there being some racist behavior there that if I had seen, I would have been very upset about. I had my own little personal experiences, but nothing that I ever had receipts for. When I saw those messages, I broke into tears. I felt like all the hard work I had done there wasn't valid. I felt like the 6 years of sacrifices that you can imagine I've made as an entertainer [to] do whatever it takes to make sure that your home is surviving and thriving — free event benefits, paying performers out of pocket, anything it took to make sure this place stood and was great — to hear that people like me would be bad for business was terrible. I really hope that no person or performer of color ever feels the way that I felt Friday ever again. I think this is not only a problem that just The Monster has — this is a cancer in our community. This is something that we all need to figure out right now. And my intentions are not to close The Monster over this, my intentions are just to say that I personally can't do any more here, until I figure out how to fix this for the world. I can't suffer through this anymore, and I can't be the barrier for people to not see it happening. If this is what you're going to say, I'm going to let them know. I think right now we're in a place in our world where we're really good at pointing blame and not creating solutions. We're pointing out everyone's flaws and mishaps but we're not saying, "Okay, now that we know that what you did was unacceptable, these are the next steps we take to heal from it." Like I said, racism and discrimination is a cancer in our community. It's like we're looking at someone who has a disease and saying, "Oh, you have a disease," and not even giving an option of treatment. I do not feel like The Monster's response and apology were adequate. I don't think that it was a sincere apology; we can see that in the immediate response to the messages. It was basically like, "Huh, I don't really care." "I think this is not only a problem that just The Monster has — this is a cancer in our community. This is something that we all need to figure out right now." Charlie's the main owner, right? Charlie's the owner, yes. And he's just been pushing it off to Italo. At the same time, I think that Italo's response to the flyer was mostly out of ignorance, and that he actually believed those racist things, not that he is a racist. We all have to look at ourselves and check the things that are unacceptable that we believe, that we've been taught, and that he's not wrong for thinking that way. You're only wrong if you realize that you have no integrity, if you are self-aware, and you continue to have no integrity. That's the only time you're wrong. He's not wrong for believing these things that he was obviously taught or brought up to believe or has seen working in nightlife for years. I worked with Italo at Splash. He's been in this game for a minute, so he's believed these things that might have worked 35 years ago with The Monster — maybe not having a Black night because it's bad for business might have been a thing, but in 2018, it is not. We won't accept it, and we won't accept hearing that kind of language. Your flier was characterized as a "Black night?" It was not even advertising a Black night. Saturdays at The Monster are a dance party open to everyone; we've been doing it for 6 years and it's never been a Black or white night. What we do is each week we put the performers that are going to be on that stage on a flyer. These were just the people that were going to be on stage that night. And they were mostly people of color. Not even all of them. FiFi DuBois is one of my good sisters and honestly, I have to slather the most sunblock on her when we go to the beach in the summers. She is the whitest queen I know, and she was on that flier. The two other dancers that were booked that evening were both darker skin Latinos even though both the owner and the general manager are of Latino descent. This was a color issue. Because I am a very brown person, and those two [dancers] are very brown people, this looks like we are advertising a night to brown people, and that's "bad for business." "We all have to look at ourselves and check the things that are unacceptable that we believe, that we've been taught." What do you think they meant by "bad for business?" They said, "It looks like we're advertising a Black night, and that's bad for business." That's when I'm like, "Ayo sis, that is too far." This can't be said or thought about me anymore. The Monster's crowd is at least 70-80% people of color. If I don't tell them this and I let them keep spending their money here, I'm wrong and I'm part of the problem now. So my intentions were to just expose it, not knowing the world would react like this. Yesterday, I was all kinds of down in the dumps because my friends work there — I love those people there. I'm not trying to take bread out of their mouths. That's not my goal here, it's just that this [microaggression at The Monster] doesn't work anymore. Another thing that can be pointed out is that while we have had Black bartenders, or even bartenders that were darker skinned, they were mixed race of some sort. Of the 5 years that I've been there, I'd say that 90% of the bar staff that is not just the security — the management team, the bartenders, the bar backs — are either white or Latino. And this has been a real problem. You can't tell me that in the city of New York, there's not one beautiful Black person that you want to work here. That's just real, we have not celebrated diversity in our employment at The Monster, and this all proved to me that these were their [true] feelings. The image of The Monster is fair-skinned. That's how I felt, and I'm sure that unless something else is proven that I'm right because the immediate response to the messages proves [I am right]. I will say that now Charlie is reaching out to me. I didn't feel like I could deal with seeking him because emotionally, if somebody's beaten down, you don't just go to the person that beat them down and say, "Okay, you can explain why you hit me." That's not an easy turn-around, so I needed a night to process my feelings and make sure whatever steps that I took, like how many people were following behind me now, were ones that cultivated change and really helped this community, not hurt it anymore. I think that we have that place there, that platform there — it's a beacon in our community. And we should keep it, not close it. We should fix it. "This is now a movement to end racial discrimination within the queer nightlife community because it exists [...] it affects our income and our ability to thrive." There's a root problem that needs to be fixed. Italo now resigning was a step, but Italo shouldn't have had the opportunity to resign. When those messages were shown to Charlie Rice, he should have been fired on the spot. Also, to add to this, Italo called me yesterday and said, "I want to apologize for my miscommunication." There is no miscommunication here, even though English is his second language and I do think that in a country like this, we all have to be very sensitive to [being multilingual]. But his intentions are clear, and when I tried to explain that to him, I said, "You're apologizing to me because the world knows. You're not apologizing to me because you think differently. When you say there's a miscommunication, it's proven to me that this is false." Here's the thing though: if you were ignorant to the fact that these ideas were wrong on Friday morning, but on Monday, you know better, then I would accept [that apology]. If you don't [know better], then this is going to keep happening. So I've put together some next steps in this movement, because I really think this is now a movement to end racial discrimination within the queer nightlife community because it exists. We hear queens from as far up as Drag Race, like The Vixen talking about the treatment of Black drag entertainers all over the country; this is not an issue that only The Monster has. [Racial discrimination] is so deep that it affects our income and our ability to thrive. White entertainers are paid better and Black entertainers are looked down upon because maybe our costume is seen as less. It's hard to overcome that [discrimination] when we're paid less. It's a real thing I've experienced in almost a decade of working in this community. What I've done now is reached out to the Stonewall Inn, because it's always important to go home, and we are working on a press conference. Not only will Charlie Rice be invited, the owner of The Monster, also the owner of Vodka Soda Bottom's Up who came under some racial scrutiny, the owner of REBAR who underwent some of the same things. I also have a new show at REBAR, and I know that these people looked at the situation and fixed it, so they will be there this week, as well as the people who have been hurt. [This press conference is] for the world to hear me tell them to their face how it felt and to see their reaction — to see the other people that have been through this say how bad it hurts, and how much we don't stand for this anymore, because if we want to heal and move past this, they have to know so they can right this wrong. And then it's their decision whether they move about it and how they move about it, and whether we support them or not if we think it's adequate. I am 100% down to return to The Monster bar, a legendary bar, if I believe that this cancer is eliminated, but only if it's 100% gone. Update 10/4/18: An earlier version of this story mentioned a press conference hosted by Honey Davenport that was slated to occur at 2 PM on Thursday, October 4 at Stonewall Inn. It is currently being postponed until further notice, while The Monster's staff undergoes sensitivity training, according to a memo received by Davenport.